The European leg of Lady Gaga's Born This Way Ball is set to kick off August 14 in Bulgaria, following a run of spring and summer dates through Asia and Australia. Tickets for the 21-date trek will go on sale later this month. 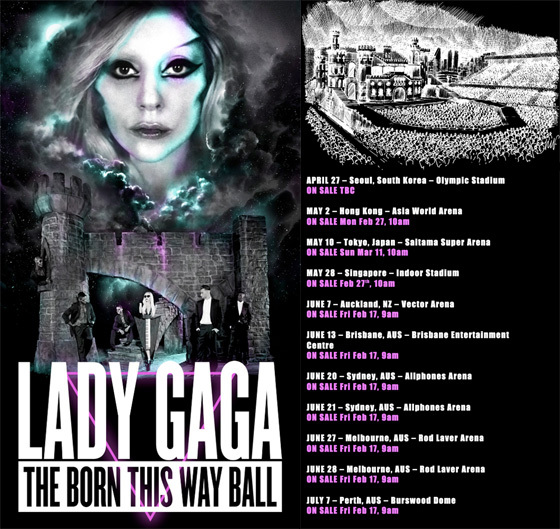 Opening for Gaga on the European leg are British glamrock band The Darkness (of "I Believe In A Thing Called Love" fame) and DJ Lady Starlight. The Born This Way Ball is in support of Gaga's latest album, 2011's "Born This Way," which topped the Billboard 200 and spent 42 weeks on the chart. "The Haus of Gaga and I have worked for months conceiving a spectacular stage," Gaga said in a statement. "The Born This Way Ball is an electro-metal pop opera. The tale of the beginning, the genesis of the kingdom of fame. How we were birthed and how we will die celebrating." Last week Gaga tweetedabout the tour and it's elaborate set-up, which, judging by the Born This Way Ball poster, will be somewhat medieval. "After 1.5 months of grueling rehearsal the stage is now fully built and set up for the last three weeks of preparation. Took my breath away," she wrote. Live Nation is again behind this tour, after steering most of Gaga's 2010-2011 "Monster Ball" tour, which grossed $188 million from 167 shows, according to Billboard Boxscore. The tour's European dates wrap Oct. 6 in Barcelona, Spain, at which point Gaga will presumably head to North America. U.S. dates for the 110-show tour are still to be announced.